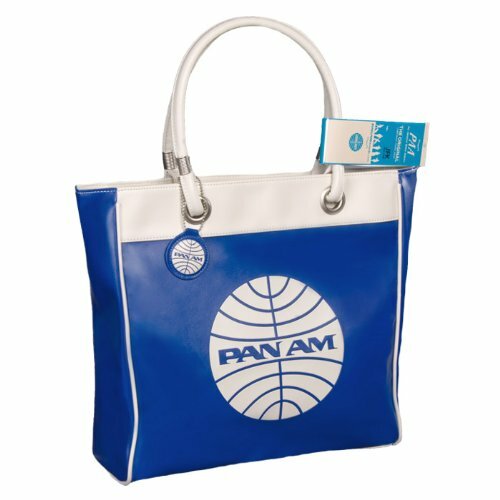 Established in 1927, Pan American was at one time the largest international air carrier in the States. The airline began as a began as a mail and passenger service between Florida and Havana and grew to be an innovator and major International force in the airline industry. Peaking in the 60s and 70s, the airline boasted millions of passengers, flying in 150 jets to 86 foreign destinations. Its slogan was The World's Most Experienced Airline, designed to instill confidence and familiarity in passengers. Back in the days when air travel was largely the province of the affluent, possessing an airline bag was something rather special - it meant you were an air traveller and thus one of the fortunate few who could afford to fly. After the arrival of the jet age in the late 50s, the first Pan Am airline bag, the Orion (above), was given away to jet -setters in the 1960s. The perfect size for on board travel. Invariably the bags were thick vinyl with the airline's iconic logo emblazoned on the front - in Pan Am's case, the sky colours of blue and white. 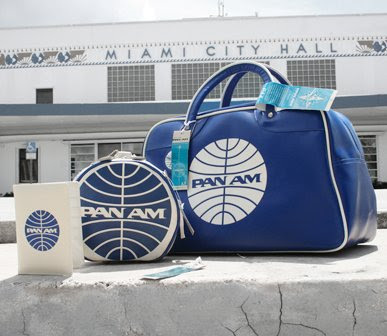 These days they have a kind of funky retro cachet and for many, serve as a reminder of the halcyon days of Pan Am and jet travel, not to mention their own youth. The bags come in four colours (white and various shades of blue) and feature clutch handles or messenger style, over-the-shoulder adjustable straps. After 64 years in the air, Pan American World Airways declared bankruptcy in 1991 as the result of a combination of factors - over-investment, government policy, deregulation, political conditions, economic downturn and increased competition. An American icon had crash-landed. 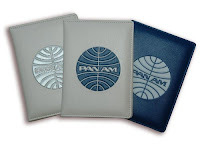 Although the Pan Am name continued to be used at various times, it no longer belonged to the original airline. 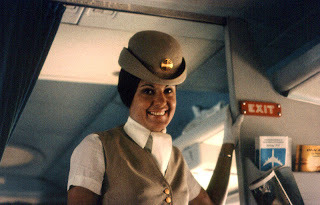 Such was the optimistic confidence of Pan Am at its peak in the 1960s, the airline actually offered a waiting list for future flights to the moon - customers could obtain a membership card to the loftily named Moon Flights Club. Alas, it was not to be. 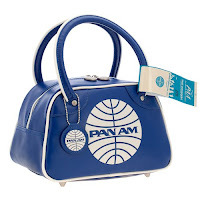 Check out the vintage bag range here.